All pests are not created equal. Termites are often the first pest people think of when they think of pests that could damage their homes, and for good reason. Termites thrive off of wood and other cellulose material, making your home the perfect meal. The National Pest Management Association has found that termites cause upwards of $5 billion in property damage every year. The problem is made even more serious when you consider the fact that structural damage caused by termites is not something that your homeowner’s insurance will cover. Controlling a termite infestation is not something an amateur should attempt as the method will vary significantly, depending on the species you are dealing with. Carpenter ants build nests in areas with damp or dead wood. Although carpenter ants prefer to hollow out trees that are diseased, weakened or dead, they won’t shy away from healthy trees, nor wooden homes. They are also quite content to make nests in styrofoam insulation panels, hollow doors and behind the insulation. Carpenter ants are less destructive than termites, but they can still cause quite a bit of damage and need to be taken care of by a professional. Powderpost beetles, or lyctid beetles, as they are sometimes called, will only attack hardwood, so they may not destroy your home like termites or carpenter ants will, but they can still do some serious damage. You can identify a powderpost beetle infestation by small, round holes in the flooring, molding, doors, cabinets and hardwood furniture in your home. If the infestation is active, you may even see a small mist of sawdust originating in the holes. In most cases, infestations occur in new homes that are built using wood that is already infested with powderpost beetles, in which case, replacing the infested wood is typically the easiest and most economical course of action. Squirrels aren’t as innocent as they seem, and believe it or not, they can do serious damage to your home. Not only can squirrels damage trees in your yard, which could potentially fall onto your home and cause damage, they also have an affinity for chewing holes in soffits and siding. Squirrels have even been known to raise families in attics. In our next blog, we’ll be going over a few more of the most destructive pests for your home, so please stay tuned to learn more. 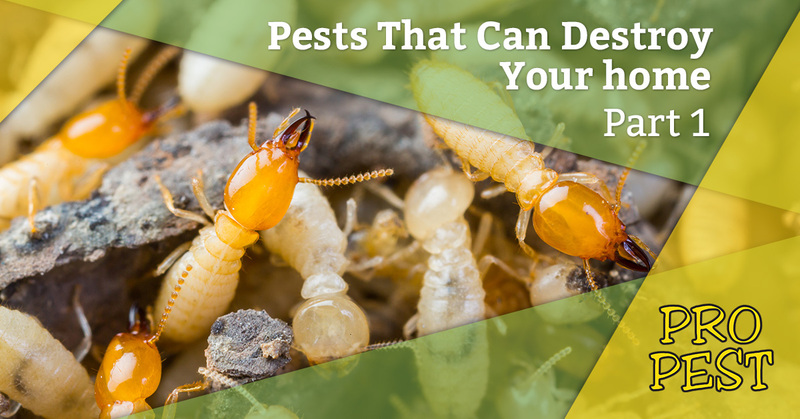 If you’ve noticed any one of these pests in your home, it’s time to call Pro Pest Bugs for professional pest control in Sealy. Get your free estimate today!